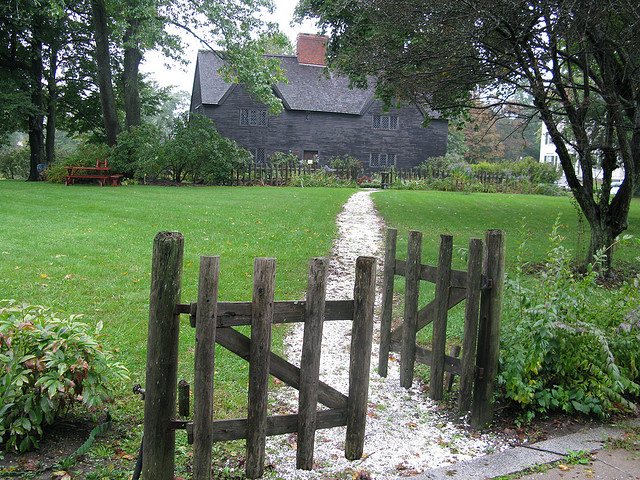 The Whipple House (in Ipswich, Massachusetts) was built in stages between the mid-1600s to the early 1700s; photo by Elizabeth Thomsen on Flickr (noncommercial use permitted with attribution / share alike). Boston became known as "The Hub" in the colonial period (for "all roads led to or from it"). This was especially true during 1775-76 when militia streamed to Boston from throughout New England and other colonies in response to the Lexington-Concord alarm and the town's seige. Everyone, it seemed, was on the road to Boston, and this tune became one of the American Revolution's most popular. Massachusetts also recognizes an official state song, a state ode, a state patriotic song , an official polka song, a state folk song, and an official glee club song. Old North State Fife and Drum plays "Road to Boston"